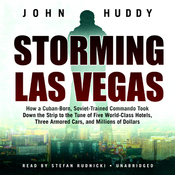 Written by John Huddy and narrated by Stefan Rudnicki, “Storming Las Vegas” is about Jose Vigoa and the robberies that he an his crew committed in Las Vegas. I really enjoyed this book and even went on extra walks just to have more time to listen to it. It is a true-crime drama with all of the elements of a Hollywood action flick. The author spends a great deal of time taking us through the preparations of each robbery, the lives of the victims, and the aftermath. Immediately gripping and thoroughly harrowing, Storming Las Vegas tells the story of a remarkable true-life crime spree – a story that was previously squashed so as not to disturb tourism, in the ultimate proof of “what happens in Vegas stays in Vegas”. On September 20, 1998, a Cuban-born former Red Army lieutenant named Jose Vigoa launched a series of raids on the Las Vegas Strip. During a 16-month spree, Vigoa robbed five world-class hotels, three armored cars, and one department store. The casinos hit were the MGM; the Desert Inn; the New York, New York; the Mandalay Bay; and the Bellagio. Lieutenant John Alamshaw, a 23-year-old veteran in charge of robbery detectives, was ordered to stop the robberies at all costs. He knew he was up against a mastermind. What he didn’t know was that he was running out of time. I bought this book from Audible. On a scale of 1 to 10 I give this book an 8 and think that anyone who enjoys true-crime and actions books will like it. 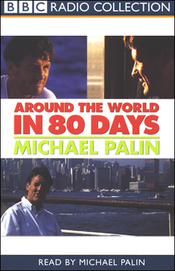 Michael Palin of Monty Python fame has done a number of shows for the BBC and this book is based on one of those series. “In the autumn of 1988, Michael Palin set out from the Reform Club with an ambitious plan: to circumnavigate the world, following the route taken by Jules Verne’s fictional hero Phileas Fogg 115 years earlier. The rules were simple. He had to make the journey in 80 days using only forms of transport that would have been available to Fogg. And so, complete with visas, running shoes, an inflatable globe, and sound advice from Alan Whicker, Michael Palin began his incredible journey. Around the World in 80 Days is one of my favorite Jules Verne stories, so when I saw this on Audible I jumped on it. Michael Palin is a funny guy and a great story teller. The only let down in this book is how fast he travels through some areas, I really wanted to hear more about many of the places he visited. I did not appreciate many of his views on America and found almost his entire time in America to be tedious and un-enjoyable, but overall I liked the book. On a scale of 1 to 10 I give this book a 7 and recommend it to those who like travel stories and/or Michael Palin. What an amazing book. 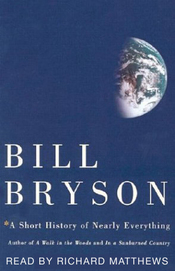 Bill Bryson manages to cover enough of the world’s history to make it really feel like you have learned a little something about everything. I really enjoyed this book; it may be responsible for my acceptance of the idea of listening to books as opposed to reading written words. The narrator Richard Matthews brought this book to life for me; I don’t think I would have enjoyed this book if I had read the printed book. The best thing I learned was that early scientists were laymen with very little if any formal training. Many of them were minor royalty who could have lived a life of leisure without contributing anything to mankind; instead they chose to pursue science and to share what they learned freely. And the part about interns in Yosemite taking baths in hot springs that are off limits is kind of gross, but also fascinating. I give this book an 8 out of 10 and recommend it to anyone with an interest in science and history. I bought this book on Audible. I really liked this book. 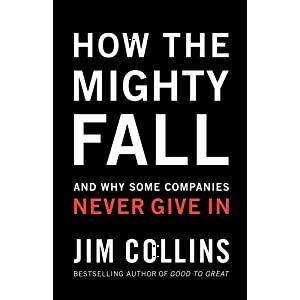 The author Jim Collins and his team research findings uncovered 5 steps that many companies follow on their path of decline. Full of examples, the book does a great job disseminating their findings in an easy to understand way. A fun note, if you listen to this audio book at 2x speed the author sounds a lot like a young William Shatner, which also helped to hold my attention. I give this book an 8 out of 10 rating. It is an interesting exploration of how companies fail. This book is a part of O'Reilly's 97 Things series where individuals contribute short entries to a wiki, which are then edited, from which 97 items are selected for a book. I feel like I got a lot out of this book, maybe the most valuable was that I need to read the book "The Pragmatic Programmer" ASAP. "…comments should be treated as if they were code. Each comment should add some value for the reader, otherwise it is waste that should be removed or rewritten." "Follow the advice of The Pragmatic Programmers and learn a new language every year." "Deliberate practice does not mean doing what you are good at; it means challenging yourself, doing what you are not good at. So it's not necessarily fun." "Deliberate practice is about learning. About learning that changes you; learning that changes your behavior." "…when writing any text in your code — whether comments, logging, dialogs, or test data — always ask yourself how it will look if it becomes public." "Professionals are responsible. They take responsibility for their own careers. They take responsibility for making sure their code works properly. They take responsibility for the quality of their workmanship. They do not abandon their principles when deadlines loom. Indeed, when the pressure mounts, professionals hold ever tighter to the disciplines they know are right." "…don't read another book. Read code." "The code should be simple. There should be a minimal number of variables, functions, declarations, and other syntactic language necessities. Extra lines, extra variables… extra anything, really, should be purged. Removed immediately. What's there, what's left, should only be just enough to get the job done, completing the algorithm or performing the calculations. Anything and everything else is just extra unwanted noise, introduced accidentally and obscuring the flow. Hiding the important stuff." "When pairing, we each bring our collective programming experiences — domain as well as technical — to the problem at hand and can bring unique insight and experience into writing software effectively and efficiently." "I get better because you make me better through your good actions." I hope to put what I have learned into practice immediately and look forward to reading more of the entries that did not make it into the book.